I have not had the opportunity to tour Big Boss yet, so I canâ€™t comment on the tour. However, I have tried plenty of their beer and they are making a good push in the Raleigh market, not just by sheer marketing, but the quality and drinkability of their craft beer. The brewery itself is located in the middle of an industrial park. This isnâ€™t the first time Iâ€™ve encountered a brewery in such a location, and I think to some degree breweries are starting to trend this way. What distinguishes Big Boss, is that they have managed to take the tasting and moved it to a dive bar. Iâ€™ll be upfront, Iâ€™m a lover of a good dive bar, and Big Boss brings it very well. Their bar is complete with leather couches, pool table, ping pong table, and shuffle board. Itâ€™s a hole in the wall, but itâ€™s not â€œdirtyâ€ as some have described it. â€œRawâ€œ is a better way to describe it. Their beers are relatively inexpensive at their bar, as opposed to what you may pay at some places in Raleigh. 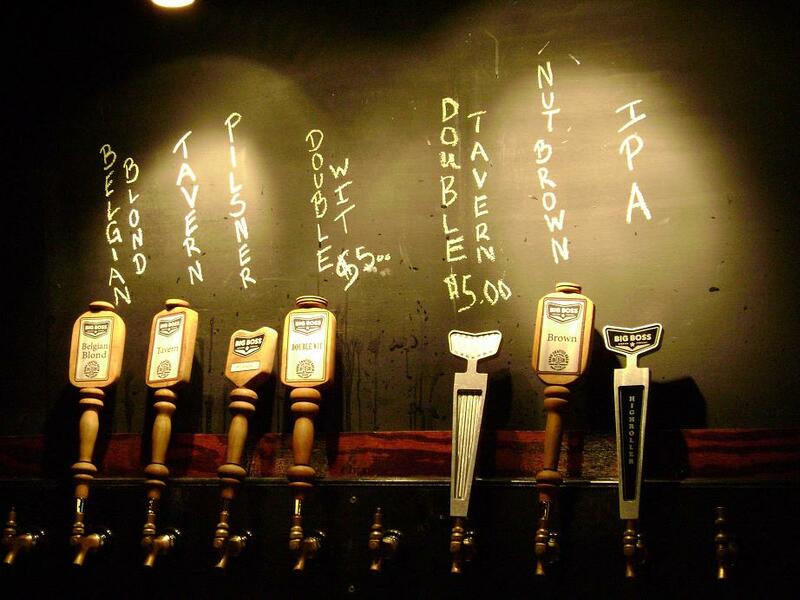 Their selection is awesome, and most times they will have plenty of beers on tap that arenâ€™t distributed, even locally. Harvest, Aces & Ates, Bockscar, as well as their Angry Angel, Helleâ€™s Belle and Blanco Diablo are all very good. The only beer I havenâ€™t liked from them is their Bad Penny. However, keep in mind, Iâ€™m not a fan of Brownâ€™s and it is their number one seller, so it must be good for most. Iâ€™d recommend this brewery/bar to anyone looking for a little something different from a brewery! one more thing, I'd have to agree that sometimes the service can be a little "off". Not rude, but not overly friendly either. Unfortunately, the reviewers here seem to be reviewing the attached pub, Horniblows, and not the Brewery itself. Big Boss is on the verge of really breaking through to the craft beer drinker in Raleigh. Their three main beers are now available in grocery stores around the area. The beers themselves are good representations of their respective styles. The Kolsh is extremely light and fruity, and is a great, and much better tasting alternative to any Light American Lager. The Belgian Blonde is definitely the best of their beers with a very pleasant fruity aroma and flavor. Their brown ale is very solid in its own right. They also normally have about 4-6 specialty brews on tap that are not available outside of the brewery. These also include cask ales, something you don't see in the South, let alone in the US. Horniblows does need some work, but that is their bar. Not the Big Boss Brewery itself. Small but upcoming brewery, they said they were expanding from 1000 barrels per year to 4000 barrels per year, which is a big jump for a small brewery. Every second sunday (or something like that) they have a free tour of their brewery, complete with free beer samples for dropping by. They also have a bar upstairs with their entire seasonal and regular lines on tap. Bought a T-shirt and Glass from them for posterity's sake. 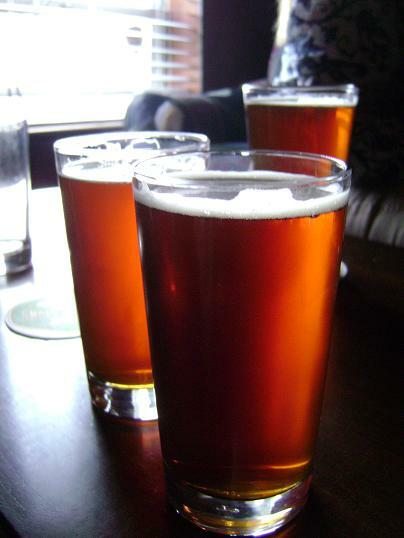 They had a large selection of beer styles, though they stuck to english or belgian ale yeasts and associated styles. Tried their three main beers, which were a blonde ale, a brown ale, and their german kolsch. All were really really good, pretty crisp and flavorful, with a yeasty/fruity overtone. I really liked all three, but the blonde ale was my favorite. It tasted like a really good weisse, which is my style of choice. They also had some other flavors, notably a double IPA, seasonal styles (like a pumpkin beer), a coffee stout, and some other variations on the belgian ale. They didnt have EVERY beer imaginable, but (to show you) I was counting which styles they didn't have rather than the inverse. Overall, great beers, if they sold down here, I would buy.